The Ethylene vinyl acetate, a copolymer of polyethylene (EVA) has been used for the preparation of thin films for the investigation. The films are prepared by room temperature using solvent casting method through varying the percentage of vinyl acetate content in EVA as 18%, 58% and 88%. Chloroform is used as a solvent for ethylene vinyl acetate, high-speed stirring resulting the homogenous dispersion of the molecules. The resultant thin films of EVA with 18%, 58% and 88% of VA are characterized under different characterization techniques. The Fourier Transform Infrared Spectroscopy (FTIR) confirms the functional groups present in the EVA films of varying concentrations of VA. Thermo Gravimetric Analysis (TGA) is carried out to confirm the Thermal Stability of the films with increase in VA content. The improvement in mechanical properties like Tensile Strength, Flexural Strength and Toughness with increase in vinyl acetate content is confirmed through mechanical studies. The dielectric properties are studied for all the three concentrations of vinyl acetate in EVA, which shows constant result on the value of dielectric constant at higher the vinyl acetate in EVA as 88%. The formation, structure, and properties of organic macromolecular thin films are subjects of current interest. Some important questions on their structure such as molecular orientation and conformational changes due to macromolecular adsorption should be asked in order to solve all the issues related to adhesion . Polymers are fascinating molecules in which local (segmental) and global (chain) motions are convoluted, giving rise to a complex combination of behaviors and properties . In recent years the ethylene vinyl acetate (EVA) copolymer has vast industrial applications due to its stable physio-chemical and dynamic properties and this makes EVA distinguishable over different other co-polymeric products . Ethylene Vinyl Acetate (EVA) which is a thermoplastic co-polymer and solid at room temperature . EVA combines the chemical and material properties of a chemically cross-linked elastomer with those of engineered plastics, which are often much easier and affordable to manufacture. It is an extremely elastic material that can be sintered to form a porous material like rubber, yet with excellent toughness. EVA has been an innovative material in many medical applications for over so many years and its wide range of properties can be tailored and manipulated to develop novel materials with numerous potential applications [5-7]. Thin polymer films play a very important role in modern day technology. Polymer coating help to preserve, isolate or decorate underlying materials. As such, stability of these polymers under variety of conditions is mandatory . Earlier investigations are restricted with EVA of minimal percentage of VA to maximum of 40%. In this study, we examined the Spectroscopic, Thermal, Mechanical and Dielectric behaviors of EVA thin films constituting three different percentages 18%, 58% and maximum of 88% of Vinyl Acetate. Ethylene Vinyl Acetate (EVA) in a solid form, Vinyl Acetate and Chloroform were purchased from Scientific Chemical Suppliers, Chennai. EVA pellets were soaked in a suitable solvent like chloroform for minimum of 9 to 10 hours and well soaked EVA is then stirred for 5 to 6 hours using a magnetic stirrer, results a transparent homogenous solution under the treatment of temperature about 30°C to 32°C. The Ethylene Vinyl Acetate (EVA), a copolymer of polyethylene has been used for the preparation of thin films. The Films are prepared by Solvent Casting method at the room temperature by varying the percentage of Vinyl Acetate content as 18%, 58% and 88% in wt. by wt. concentrations. The thicknesses of the resultant films are about 0.2 mm and even textured. The films are then cut accordingly for testing and analysis. Fourier-transform infrared (FTIR) spectra in absorbance mode were carried out for EVA films consisting percentage of VA as 18%, 58% and 88% with the Perkin Elmer Spectrum Two FT-IR instrument. Entire region of 4000 cm-1 to 450 cm-1 is covered by this instrument. The thermal behavior of EVA films of different VA content is studied by performing Thermo gravimetric analysis (TGA) with the instrumentation Perkin Elmer/Pyris made under the temperature of 20°C /min and the weight loss of sample is measured against the temperature ranging from 50-600°C in a 20 ml/min flow of N2 gas. The Mechanical properties of EVA films were measured by ASTM D-638-00 an Instron testing machine Model 15567 using a crosshead speed of 10 mm/min. Tests were carried out with a specimen of 5 cm length and 1 cm width was cut from each EVA film and the values are reported. Dielectric characterization is one of the useful characterizations of electrical response. The frequency dependence of these properties gives a great insight into the material’s application. Suitably cut and shaped EVA thin films are subjected to dielectric studies using HIOKI 3532-50 LCR HITESTER meter. The measurements are made at frequencies ranging from 100 Hz to 5 MHz. The Ethylene Vinyl Acetate thin films with varying concentration of Vinyl Acetate are analyzed by infrared spectroscopy. The IR spectrum of EVA film with 18%, 58% and 88% VA is presented in FIG. 1. The surface layer changes in polymer are studied relative to the absorption regions O-H (3100-3600 cm-1), C=O (1739 cm-1), C=C (1600-1700 cm-1), CH3 (1372 cm-1) and C=O (1237 cm-1) which are examined in comparison (FIG. 2) with the CH2 group deformation bands (1464 cm-1). This band can be used as an integral standard to monitor the functional groups of EVA with varying VA content in it . The main spectral features of an EVA polymer are given in TABLE 1. These spectral features can be identified based on the analysis of the literature data . The main absorption band of the acetate function appears at 1739 cm-1 . 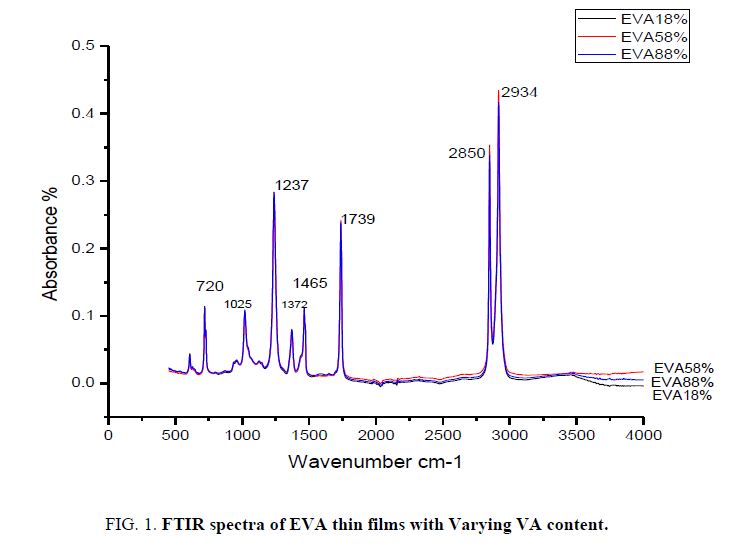 Figure 1: FTIR spectra of EVA thin films with Varying VA content. Figure 2: TGA curves of EVA with vinyl acetate as 18%, 58% and 88%. Table 1: Attribution of Infrared absorption bands of EVA films. The thermal stability of all these EVA films with different Vinyl Acetate (VA) content in it is investigated through TGA under different atmosphere. All the samples show two weight loss stages. The initial increase of room temperature to almost 300°C is attributed to the release of the moisture and the residual organic solvent entangled in the polymer chain does not show any significant weight loss and the weight percentage almost remain constant . The thermo-oxidative degradation of EVA with three different percentage of vinyl acetate in it occurs in two consecutive steps. The first step (300-380) corresponds to the deacylation of vinyl acetate group of EVA with the elimination of acetic acid and the formation of two bonds. The second step (380-450) may be assigned to the further degradation of vinyl polyethylene chains formed in the first step [13,14]. With increase in temperature in the second stage there is a rapid weight loss in all the samples, which is due to the breakdown of the backbone [15,16]. When comparing the degradation temperature of all the three samples with increase in percentage of vinyl acetate the degradation temperature shows the slight variation in its value at the maximum of 10°C. But the range of degradation remains same. Films of Ethylene Vinyl Acetate (EVA) with Vinyl Acetate (VA) percentage as 18, 58 and 88 have been produced through solvent casting technique. All the films are of even textured and smooth in appearance are selected for undergoing tensile testing. FIG. 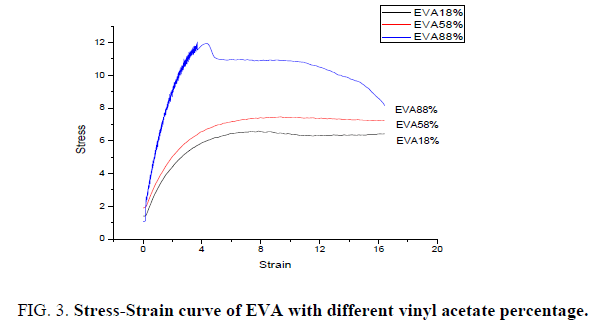 3 shows the stress-strain relation of EVA with varying percentage of Vinyl Acetate in it. The mechanical properties like tensile strength, flexural strength and toughness of all the three films are measured and tabulated in TABLE 2. It shows that the tensile strength increases with increase in percentage of Vinyl Acetate in EVA. It is interesting to note that the toughness of the material which is the dependent factor of flexural strength also shows an increment with increase of vinyl acetate percentage in EVA. The improvement in mechanical properties can be attributed to the nature of vinyl acetate which acts as stress concentrator during the deformation process . Figure 3: Stress-Strain curve of EVA with different vinyl acetate percentage. Table 2: Mechanical properties of EVA with different percentage of vinyl acetate. Dielectric measurements and calculations were performed on EVA with different percentage of vinyl acetate in it. The dielectric permittivity is the measure of polarization of the material with respect to applied field strength. It means that greater the polarization developed in the material in an applied field of given strength, greater the dielectric constant will be . It is seen from the graph that the dielectric constant decreases with increasing frequency. It is proved that the taken materials exhibit typical dielectric behavior especially at higher temperature of 120°C  (FIG. 4). Figure 4: Typical plot of variation of dielectric constant with frequency for various percentage of VA in EVA. The fall of dielectric constant with frequency of EVA with 18% of VA happens gradually, the maximum at lower frequency to minimum at higher frequency. For EVA with 58% of VA the constant range of dielectric constant reaches very quickly in the minimum value of frequency itself and surprisingly for EVA with maximum of 88% of VA shows almost constant range of value for dielectric constant in the beginning to till the end range of frequency. This implies that EVA with higher percentage of VA shows maximum of dielectric nature compared to EVA with lower percentage of VA in it. Films of Ethylene Vinyl Acetate copolymer with varying percentage of vinyl acetate as 18%, 58% and 88% were prepared by solvent casting method at room temperature. The FTIR spectra confirm the functional groups present in the films. The range of degradation temperature of the films is identified by TGA studies. The mechanical properties like stress-strain relation, tensile strength, flexural strength and toughness correspond to the percentage of vinyl acetate in EVA are measured. Mechanical data indicates the improvement in tensile strength of EVA with increase in VA percentage up to 88%. 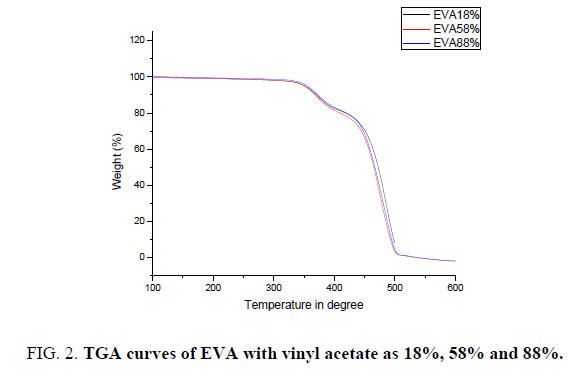 The dielectric studies on the film shows that EVA with higher percentage of VA has maximum of dielectric nature compared to EVA with lower percentage of VA. To conclude, an elastomeric EVA with varying percentage of VA shows improved toughness and stability that can be suitably used for polymeric products like hot-melt adhesive, polymer coating, packaging products and more. Brogly M, Bistac S, Schultz J. Persistence of molecular orientation in adsorbed ethylene-vinyl acetate copolymer nanofilm studied by fourier transform infrared reflectance spectroscopy. Macromolecules. 1998;31:3961-73. Casalini R, Roland CM. Anomalous properties of the local dynamics in polymer glasses. 2008. Billmeyer FW. ?Text book of polymer Science? John Wiley and Sons, Inc., NY, USA. 1994. Osman Af, Alakrach AM, Kalo H, et al. In vitro biostability and biocompatibility of ethyl vinyl acetate (EVA) nanocomposites for biomedical applications. RSC Adv. 2015;5:31485. Peacock AJ. Handbook of polyethylene: Structures: Properties and applications. CRC Press, New York, USA. 2000. Reyes JD. Innovative uses of ethylene vinyl acetate polymers for advancing healthcare. SPE Polyolefins Conference, USA. 2014. Fink JK. Ethylene vinyl acetate copolymers. In: Handbook of Engineering and Specialty Thermoplastics: Polyolefins and Styrenics, John Wiley & Sons, Inc., Hoboken, NJ, USA. 2010; pp:187-209. Bhatta UM, Khushalani D, Satyam PV. Thermal stability of gold-PS nanocomposites thin films: Bull Mater Sci. 2011;34(4):595-9. Korzhenko AA, Shapoval GS, Syromyatnikov VG. Electrochemical reduction of functional groups in the cathodic exfoliation of an ethylene vinyl acetate copolymer. Theoretical and Experimental Chemistry. 1994;30(6):1994. Glikman JF, Arnaud R, Lemaire J,Photooxidation and photolysis of ethylene and vinyl-acetate copolymers at short and long-wavelengths. Makromol Chem. 1987;188:987-1004. Therias SM, Fanton E, Luc gardette J, et al. Polymer/carbon nanotube nanocomposites: Influence of carbon nanotubes on EVA photodegradation. Polymer Degradation and Stability. 2007;92:1873-82. Zhang X, Zhu J, Haldolaarachchige N, et al. Synthetic process engineered polyaniline nanostructures with tunable morphology and physical properties. Polymer. 2012; 53:2109-20. Zanetti M, Camino G, Thomann R, et al. Synthesis and thermal behaviour of layered silicate?EVA nanocomposites. Polymer. 2001;42: 4501. Lu X, Ng HY, Xu J, et al. Electrical conductivity of polyaniline?dodecylbenzene sulphonic acid complex: Thermal degradation and its mechanism. Synth Met. 2002; 128:167-78. Chen T, Dong C, Li X, et al. Thermal degradation mechanism of dodecylbenzene sulfonic acid- hydrochloric acid co-doped polyaniline. J Polym Degrad Stab. 2009;94:1788-94. Patra SK, Prusty G, Swami SK. Ultrasound assisted synthesis of PMMA/Clay nanocomposites: Study of oxygen permeation and flame-retardant properties. Bull Mater Sci. 2012;35(1):27-32. Pattanaik A, Bhuyan SK, Samal SK, et al. Dielectric properties of epoxy resin fly ash composite. Mat Sci Eng. 2016;15. Madakbas S, Elmer K, Kayahan E, et al. Synthesis and dielectric properties of Poly(aniline)/Na-bentonite nanocomposite: Science and Engineering of Composite Materials. 2010;17:145-53.